1879: Actual Play: Sneaking Into The Castle – FASA Games, Inc. In our last episode, our heroes had made their way to Vienna by airship, although Sweet William had come off a little the worse for wear after a chance encounter with a gryphon over the forest. While Sam Ridley, daredevil airship pilot and owner of Sweet William, and his staunch mechanic, Coby Rentesze, tear down, clean up, and rebuild the propeller housing, Bethelie Lepercq has used her Connection with the Wien underworld to locate a street mage, what in London would be called a Mumper. She and Thierry Dessalines, the party’s Byron, have gone to negotiate with Eike Wertheim, a woman of some repute in certain circles, at a quiet little kaffeehaus in a side street near the Allgemeines Krankenhaus, well out from the Innere Stadt and its seat of government, and tucked up in the shadow of one of the last remnants of the Alte Linienwälle. The players and the Gamemaster each make Haggle Tests against their respective Social Defenses. Bethelie scores an extra success against Eike, who barely makes her roll. Thierry, who doesn’t quite make the Target Number, remains silent rather than cause a problem. The scene is played out according to the results. Over cups of strong black coffee dressed with whipped cream, powdered sugar, and a touch of cinnamon, Bethelie lays out the situation, in general terms as no agreement has yet been reached. The parties all understand that details will be forthcoming if a deal is struck. Bethelie, Thierry, and Sam must make their way into a moderately fortified stronghold, a private residence, not any official government facility. They need to do this as quietly as possible, as they will be badly outnumbered by the staff. The operation itself is a scouting mission, and possible retrieval if the object of interest resides within the facility. Eike demurs until reassured that the target is in fact an object and not a person; she does not do extractions. They tend to get messy. Bethelie’s party will need Eike’s assistance for general cover, enhancing the shadows, quieting their footsteps, and the like, which is well within the usual work of such a mage. There may also be arcane protections on the facility. The Gamemaster decides that enough information has been given for Eike to make a Knowledge (Secrets of the Aristocracy) Test. The roll explodes and ends up with a 27. “You already know our destination?” Bethelie asks, one eyebrow arched in concern. Thierry covers the bill at the end of the evening, and arrangements are made for Eike to meet the party at the flugplatz by midnight, as a hasty departure will be necessary. A few hours later, Sweet William touches down in a pasture a short distance from the schloss of Eduard Egon, Graf von Fürstenberg-Weitra. Sam Ridley makes an Airship Pilot Test to see if he can bring his Giffard in low enough to maybe not be spotted, and make the landing with no ground crew or lighting. This is a critical Test, so the player spends Karma, and rolls a 32. Anyone trying to spot the Giffard against the cloudy horizon is going to have a very tough time of it, and not only has Sam brought the airship down safely, he’s even managed to put it at the far end of the pasture from the cows without spooking them. The party, consisting of Sam, Bethelie, Thierry, and Eike, make their way through the woods between the pasture and the outer wall of the schloss. Sam, being ever practical, obtained cat-eye goggles for his team, expensive devices but granting night vision equal to that of an elf. Eike murmurs a brief chant, and grants herself the same gift for a time. This costs the GMC a point of Strain. The Gamemaster notes it down. Eike must pace herself carefully so that she doesn’t run out of Damage points before the party makes their exit. At a gap in the tumbledown remains of the boundary wall, Thierry has a quick look for technological security measures, while Eike checks for arcane ones. Thierry’s player makes a Detect Trap Test. The Gamemaster makes an Astral Sight Test for Eike. The Gamemaster makes a Spellcasting Test for Eike against the party’s highest Mystic Defense, plus two to cover all three members, and casts an Improve Stealthy Stride, granting everyone a bonus to moving silently for a time. A few more points of Strain are marked off. The party moves carefully across the schloss grounds, keeping to cover and shadow as best they can. There’s some nasty stretches of open ground, and the topiary can’t be trusted to not come to life and attack. (Everybody knows that old wheeze.) Fortunately, Sam’s investment in goggles pays off, as the party can clearly see the guards up on the roof, and time their movements to cross the open areas for when the guards have just passed by. A few tense moments, and they’re all up against the wall of the schloss proper. Thierry’s player makes a Detect Trap Test, decides the result is good enough and skips spending Karma on it, and makes a Lock Picking Test to follow it. Both succeed. A little bit of work, and Thierry has a window open, and the party climbs in, avoiding stepping on the floor directly below the sill. They’ve made it into the schloss, into what appears to be a maid’s pantry, full of slightly musty linens and cleaning supplies. Thierry secures the window, but leaves it unlocked, in case they need to make a quick exit the way they came in. Sam takes point on the exit, and a jolly good thing, as he opens the door to a very surprised guard. Sam has a Surprised advantage over the guard, who cannot take an Action this round and is at -3 to his Defenses. Sam’s player makes an Unarmed Combat Test against the guard’s lowered Physical Defense, gets two extra successes, pins the man’s arms and covers his mouth. 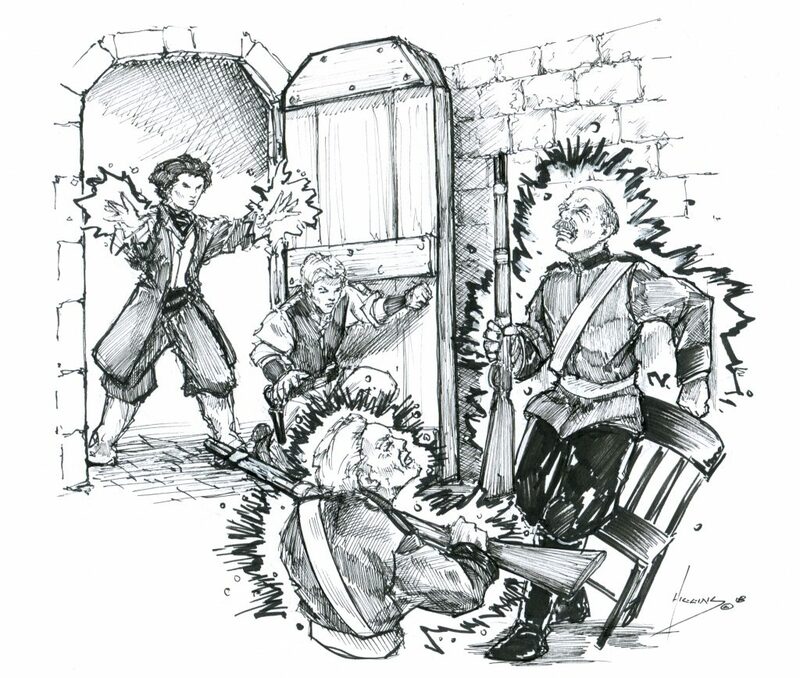 Bethelie can slip out the door around Sam, and does so, putting a gun to the guard’s head and cocking an eyebrow at him. The Gamemaster doesn’t bother rolling. The guard surrenders, and is quickly left trussed and gagged in the pantry. Bethelie adds a thumb squeeze under the jaw to put the man out for a short time. Consulting a map obtained from the Wien national archives, and assuming that the current Graf is likely to use the same office as his predecessors, the party makes their way through the back corridors of the schloss and up the maid’s stairway to the first floor. Sneaking a butcher’s out the hidden staff door into the hallway, Sam holds up two fingers, then points in the general direction of the office. Eike nods, and takes a couple of deep breaths to prepare herself. Eike will have a Surprised advantage against the two guards in the hallway. This puts their Mystic Defense at -3, and allows her one action before they can roll initiative and move. The Gamemaster spends karma on her Spellcasting Test, resulting in three extra successes on a Stun spell. With a +3 Step bonus and karma spent on her Willforce for the Effect Test, Eike does 47 points of Stun damage to each guard. One is knocked out. The other rolls a 1 on his Knockdown Test, resulting in a spectacular failure to stay on his feet. Eike raises her hands, nods to Sam. He pops the door open, and as the guards turn to see what’s going on, Eike lets loose a brilliant green bolt that hits both of them. The nearer guard collapses to the floor, unconscious, while the further staggers back, and collapses into a chair that creaks alarmingly (it’s a few centuries too old to be flumped down on like that) and likewise collapses, dumping the guard onto the floor with a loud splintering crash. Initiative gets rolled. Sam is up first, then Bethelie, then Thierry, then the guard, and finally Eike. Sam makes an Unarmed Combat Test against the guard’s Physical Defense, which is lowered by his being Knocked Down, and drops on the guard like a ton of bricks. He does enough damage with his attack that the others have nothing to do but tie up the two guards and drag them into the service stairway. “Was ist los?” a voice calls up the stairway, suspiciously. Sam’s player spends karma on a Slough Blame Test and gets a 19, easily beating the downstairs guard’s Social Defense. “Das klang teuer, es wird aus deinem Gehalt kommen,” the man downstairs says. “Kein Bier für Dummkopf für eine Woche, wahrscheinlich für das Beste.” Sam adds a sardonic laugh, and Thierry throws in a grumpy growl. “Ja, ja,” says Sam, and is so very grateful for the German lessons he took at technical college, never thinking he’d use the language for more than reading Prussian airship manuals. Thierry picks the lock on the Graf’s office, and Eike makes an Astral Sight Test before he opens the door. Thierry freezes, and cautiously moves back away from the door. Eike spends a moment examining the wards, protective enchantments laid on the Graf’s office, to see what exactly they do. The Gamemaster makes an Astral Sight Test, having already decided before the game session what the ward Target Number will be. Eike has to throw karma on the Test to succeed, and the Gamemaster notes down the karma usage and the Strain from the Astral Sight. Eike is running up quite a bill here in terms of her exertions. “I can slip us past but it’s going to be tricky.” She lines up Bethelie, Sam, and Thierry, and begins the working. The Gamemaster makes a Spellcasting Test for Eike, and throws in karma, as she’s going to need the boost. The Test result exceeds the Target Number for the wards by one point. Bethelie opens the door and the party goes into the Graf’s office, Eike last, and then the hired mage sags into an overstuffed chair by the fireplace. “Earning my marks,” she says, rather pointedly. The party members each make Awareness Tests. Thierry adds his Knowledge (Building Security) and Bethelie her Espionage Skill to look for hidden storage areas, false bottoms in drawers, and the like. They turn up quite a haul. Most of it is just your basic tax evasion, double sets of account books and the like, but the letters in the secret compartment in the bottom desk drawer are a treasure trove. Thierry decides to leave this argument for later, but nods to acknowledge the point. “And now we know what the Graf is doing in the basement,” Sam comments. “This verges on the Promethean here.” He gives a (somewhat justified) disgusted frown. So will Otto von Schmerz be in the lab with Eduard? Will our heroes be able to finally get a proper accounting for all the trouble they’ve been caused? Will Eike be able to learn the secret of Eduard’s experiments and take it back to her community before the lab gets forcibly disassembled? Will Thierry reconsider his prejudices? What social change will Bethelie foment next? Tune in next time for Actual Play!